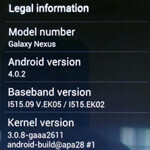 Verizon Galaxy Nexus updated to 4.0.2 – more bugs squashed ahead of release? The news on Verizon’s Galaxy Nexus is coming hot and heavy today – right on the heels of Verizon’s statement that the Galaxy Nexus is “still on track to be released this year” and the discovery of the official Verizon online simulator for the new Nexus, word comes that Verizon is pushing out an OTA update, bringing the Verizon version of Ice Cream Sandwich to 4.0.2. According to tipsters this is a bug-squashing update, so perhaps this is what Verizon was waiting for before releasing the phone. Of course some think that the delays have had nothing to do with bugs, but instead Verizon’s ongoing negotiations with Google over Google Wallet. Either way, it’s good to see that the phone is being actively improved prior to release. If we’re lucky, this may be the update Verizon is looking for, in which case the Galaxy Nexus could be released shortly. Verizon stores already have the phones in stock, so it’s just a matter of green-lighting their sale. please release it NOW !!! Its coming tomorrow this information is from sales reps in nyc. It is for sure.... We. Got them in today! !